Within the continuum of natural-to-novel ecosystems − i.e., from the ‘pristine’ to the greatly intervened − this paper emphasizes the role of design within highly modified ecosystems in areas of urbanization. It is argued that, as certain landscapes (particularly urbanized ones) can never be restored to original levels of historical ecological fidelity, they should be treated as both cultural and ecological landscapes. It is then proposed that these anthropogenic landscapes would be ready canvases for designed (or planned) novel ecosystems that could be inculcated with ecological function and systems delivery, yet having profound aesthetic manipulation. Based on this landscape architecture perspective, it is suggested that ecologists may not have fully explored cultural interventions in restoring landscapes, especially within the agency of design. A design strategy for the biological hotspot of Perth in southwestern Australia is then provided as a relevant example of how novel ecosystems can be designed. Without an acute and novel approach to modifying current development practices, Perth’s biodiversity is on track for considerable deterioration. From this exploratory backdrop, it is elaborated how neo-baroque design strategies can be used for structuring ecological systems to create resilient and productive novel ecosystems grounded in a critical and autochthonous aesthetic of botanical complexity. Integrating novel ecosystems (vs. historical ones) as endpoints for ecological restoration has contentiously been proposed as a potential and more realistic outcome for addressing the seemingly unavoidable dilemma of ‘restoring’ ecosystems (sensu strictu) within the Anthropocenea. In this regard, much of the debate has justifiably centred around the viewpoint of biological conservation and environmental stewardship, and, e.g., whether novel ecosystems could represent innovative planning or a lowering of the bar for standards of restoration. As part of the multidisciplinary discourse endorsed by this journal, this paper approaches the debate from an altogether different field by elaborating on existing novel ecosystems from the perspective of landscape architecture, whereby these systems are viewed as platforms for cultural (human) engagement. Certain novel ecosystems (particularly those interfacing with modern urbanism) could be viewed as purposefully designed landscapes, which encompass both cultural and ecological values. In addressing the design of novel ecosystems, landscape architecture represents an allied field in attempts to create and define translational strategies in the restoration of ecological function (Musacchio 2009). Within its own aesthetic discourse, landscape architecture has evolved from one of scenographic intent (i.e., where the view or scene is the aesthetic driver) towards that of a systematic aesthetic based in McHargian roots (i.e., at times referred to as ‘eco revelatory’ in which landscape systems are the aesthetic driver) (Thayer 1998; Windhager et al. 2010; Howett 1998; McHarg and Mumford 1969)b. And so, under the assumption of an ecological continuum ranging from near-natural or ‘wild’ landscapes, having historic and ecological fidelity, to highly intervened and altered landscapes, which require extensive human management to sustain their ecological function, this paper focuses on the latter; more specifically, the decidedly modified and often erased ecosystems resulting from urbanization. This paper then proposes that these altered landscapes are a ready canvas for designed novel ecosystems to be inculcated with ecological function and systems delivery, yet having profound aesthetic manipulation (Figure 1). It is suggested that ecologists may not have fully explored cultural interventions when attempting to restore disturbed landscapes, particularly within the agency of design. While this contribution may appear atypical for conventional ecological forums, the design discipline of landscape architecture may offer translational strategies for engaging and valuing human participation in ecological restoration by expanding the debate surrounding novel ecosystems to allied fields. 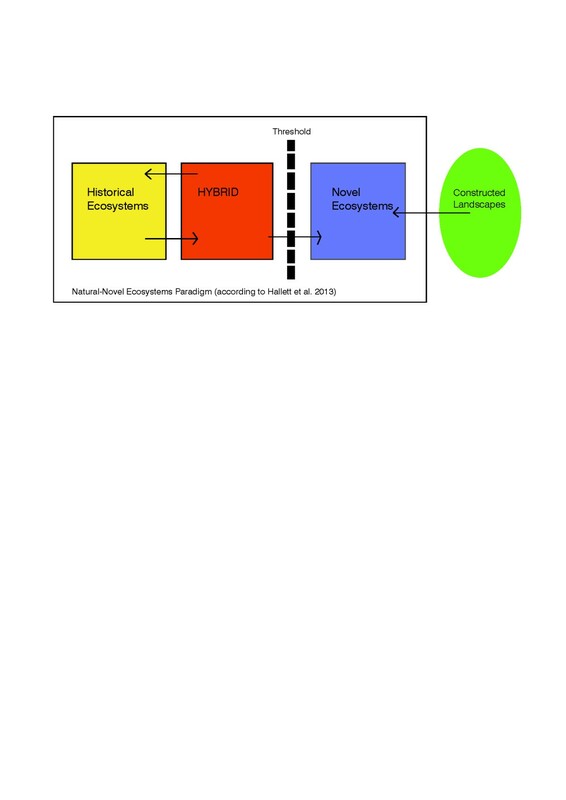 The role of cultural (designed) landscapes within a novel ecosystem continuum. The disciplines of ecology and biological conservation have recently attempted to articulate the benefits of design as a relevant cultural and aesthetic endeavour (Barrett et al. 2009a; Gobster et al.2007). In this regard, Barrett et al. (2009b) and Felton and Pickett (2005) advocate creating ecological ‘designed experiments’ where public landscapes are created by melding analysis and aesthetics, and studied collaboratively by both ecologists and designers (Felson and Pickett 2005). Within the distinct fields of landscape architecture and landscape ecology, there is a seeming desire for a merger of ideas and goals; but such a merger is far from being explored exhaustively. Musacchio (2009) proposes an avenue of translational research as ‘a collaborative learning process between scientists, designers, planners and engineers who seek to solve complex environmental problems by connecting scientific theory, concepts, and principles to the design and planning of the built environment.’ In keeping the discourses separate, hazards of language and methodologies are revealed. For example, in landscape architecture, there is a risk of designing ‘green-washed’ landscapes, whereby ecosystems are veneers of ecology, created without sufficient consideration for the necessary requirements and complexity of self-sustaining, stable and locally appropriate ecosystems. Whereas, within ecology, landscape design risks becoming a management plan rather than a synaesthetic cultural endeavour (Haila 2007), undervaluing the potential of human interaction and subsequent values created. In many of these endeavours, the translation is typically and unilaterally from science to design and rarely from design to science (Lovell and Johnston 2008). This incongruity acknowledges the question: can design strategy engage and substantiate science? Additionally, within the paradigm of novel ecosystems, can design become an instrument in the toolbox of ecological restoration to reinstate cultural landscape values? In addressing these questions, it is useful to begin by reviewing how similar language is used across disciplines while accounting for variations of meaning and potential outcome, particularly within the shared binary of culture and nature. Historically, it has been accepted that a dualistic opposition between culture and nature exists (Haila 2000). In this regard, many parallels can be made to associated terminology stemming from the purely scientific realm (Kowarik 2011). For instance, Kowarik uses a non-scientific conceptual framework referring to a ‘four natures approach’ (Table 1) having noticeable similarities to other scientific paradigms (Ellis et al. 2013)c. In this regard, Kowarik’s Nature 1 is the ‘old wilderness’ (pristine ecosystems), Nature 2 is the ‘traditional cultural landscape’ (agricultural landscapes), Nature 3 is ‘functional greening’ (gardens and parks), and Nature 4 is the ‘new wilderness’. The latter is where both cultural and natural mechanisms begin to assert themselves, thereby creating novel ecosystems (Kowarik 2005). The ecological perspective does not differentiate between happenstance and conscientious design; therefore, the cultural describes historic usage rather than human agency (i.e., design). Consequently, Nature 4 may occur within ‘cracks of the sidewalk’ or in woodland succession on abandoned industrial sites − these may then be defined as so-called novel ecosystems. Here, the concept of novel ecosystems directly applies to urban ecosystems, since even the value of less-than-pristine landscapes can contribute to overall ecosystem function, social benefits and biodiversity conservation. Yet, by defining Nature 4 as an act of mere happenstance, the synaesthetic potential (i.e., the engagement of the senses) of landscape is not achieved. In contrast, Hunt’s articulation of the Renaissance construct of the Three Natures (Table 1) finds a continuum (or ‘sliding scale of cultural intervention’) but posits the 3rd Nature as ‘some conjunction of metaphysical experience with physical forms, specifically some aesthetic endeavour – the wish or need to make a site beautiful’ (Hunt 2000). Hunt’s 3rd Nature is not just about the functional amenity of landscape, but involves a considered spatial proposition that encompasses beauty and delight. It is this deliberate act to engage the sensual that is needed in creating culturally and ecologically appropriate novel ecosystems. †As adapted from Kowarik (2005); ‡As adapted from Hunt (2000). Landschaft Park Duisburg-Nord and some of the activities that echo those found in National Parks. The refurbished gasometer serves as a place for scuba diving and remnant walls places for climbing. ● Tanner Springs Park by Atelier Dreiseitl in Portland OR (USA): A recovered post-industrial wetland in a densely urbanized area. 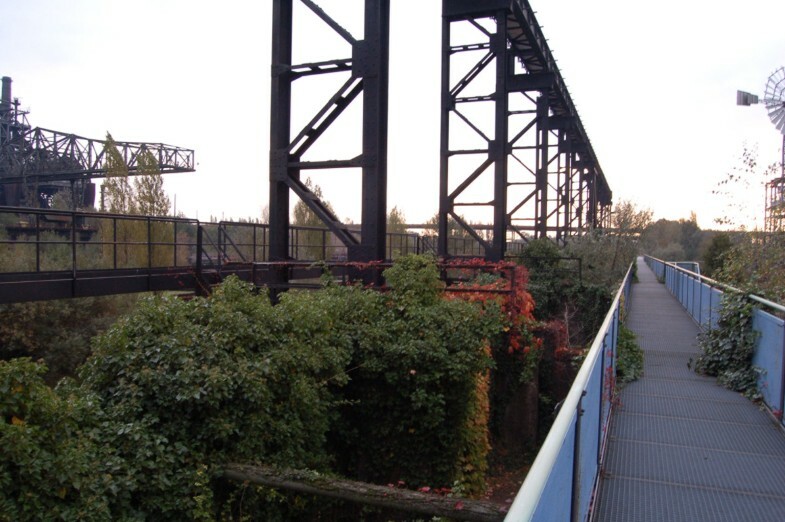 Landschaft Park Duisburg-Nord showing Kowarik’s Fourth Nature plants returning by happenstance rather than imposition. In the design of these spaces, narrative, metaphor and storytelling are considered tools of landscape architecture, thereby revealing human intervention while celebrating systems renewal. The establishment of these landscapes required a significant long-term commitment to rehabilitation, as well as an acknowledgement that the final landscape is distinctly a cultural landscape, not a replica of an ecologically historic landscape. While these landscapes could represent clear beneficial elements of novel ecosystem design it remains to be seen whether these cultural endeavours can become relevant to those working in ecological restoration reciprocally with design informing science. A common feature of Duisburg-Nord Landschaftspark, Tanghe River Park, Tanner Springs Park and others is their renewed engagement as novel cultural landscapes; this engagement was directly achieved by careful design of otherwise derelict or highly degraded sites. Some proponents within ecology, specifically novel ecology, have found merit in the relevance to such engagement (Higgs 2003). These strategies find particular relevance in addressing the increasing number of sites for which there are no ecological references or that arise as an unavoidable consequence of increasing urbanization, agricultural expansion and industrialization associated within the Anthropocene. Proximity, nativeness and gardening are all strategies that ecologists have already brought into the debate (Miller 2006; Standish et al.2013; Goddard et al.2010a). However, these deliberations avoid some key characteristics of beloved and valued places (both natural and non-natural), including a landscape’s inherent qualities of sensuality, wonder and delight, all arguably found in the aforementioned designed landscapes. While these are not likely terms to be found within a scientific discourse, they are not entirely unheard of within the general realm of science. In writing autobiographically of their introduction to the sciences, many known and unknown scientists use descriptive words like curiosity, delight, pleasure, and wonder in describing their entry to the scientific world (Lightman 2006; Wilson 1984). Further historical recollection also reveals the occupation of scientists in explaining and promulgating these sensory endeavours. In sixteenth-century Europe, scientists were called together to make sense of ‘a whole new reality that embraced the expanding boundaries of the known physical world and hitherto unimagined richness and complexity in terms of natural phenomena. Not only plants but also animals and minerals unknown to the ancients were waiting to be studied, described and – most challenging of all – classified according to rational scientific criteria (Tomasi 2005). This confluence became physically manifest in the botanic gardens of the seventeenth century, also known as ‘gardens of knowledge’. In this, scientists of the Baroque era engaged in an age of ‘scientific sublimation’ or a search for the sublime through scientific investigation (Tomasi 2005). A baroque quality inherent to all of this (both in the arts and science) is that of meraviglia referring to ‘a sense of wonder’. In the current Anthropocenic age of rapid change due to a changing climate, the Baroque suggests a technique that writes the sensual into the systematic and merges the synaesthetic with the scientific by inscribing intervention ecology with qualities of meraviglia, creating what Lyle (1991) termed ‘deep forms’. Recalling the introductory view that certain novel ecosystems could be viewed as purposefully designed landscapes that encompass both cultural and ecological values, it is proposed hereafter that this particular baroque quality could provide one possible bridge, linking and engaging the role of culture in ecological design to inform the science of ecological restoration. Accordingly, what follows is a proposition for a design strategy for the southwest of Australia, situated within the Southwest Australian Floristic Region (SWAFR) − an apparent ready canvas for novel ecosystems and systems renewal in urban areas. The SWAFR − an area of 302,627 km2 and home to the city of Perth – is amongst the Earth’s richest in endemic species and is recognized as one of 25 global biodiversity hotspots (Myers et al.2000; Hopper and Gioia 2004). The highly weathered and nutrient deficient soils support a rich variety of woodlands, forests, heath and bush, all well adapted to local Mediterranean weather patterns. Within Perth midstorey banksia woodlands, coastal heath and kwongan, intercepted occasionally by large wetlands, predominated historically. The ocean to the west and the longitudinal Darling Scarp to the east create perceptible boundaries for development and in turn promote an elongated urbanization pattern, north to south following the coastline. Where extant in undeveloped areas, vegetated areas remain of high ecological fidelity and unique biodiversity but are currently under threat due to urbanization commensurate to a booming mining economy and a rapidly growing population. Despite the undeniable benefits of this socio-economic growth towards human well-being, the rate of change associated with this development has led landscape architects, citizens and conservationists (among others) to sound their concern over the planning and environmental management (i.e., by government agencies and developers) of disturbed lands and remnant landscape patches having high ecological integrity (Hobbs et al. 2011). Equally current landscape architectural and development practices do not always fit well into the complexities of the SWAFR’s old climatically buffered and infertile landscapes (OCBILs, Hopper 2009). In this respect, development has generally been predicated on established northern hemisphere practices, e.g., within the context of designated young often disturbed fertile landscapes (YODFELs). As an example of such development, artificial lakes, reminiscent of those found in a verdant English countryside, are constructed into the free-draining dunes of the coastal heath. High-input landscapes, both nutrient and water demanding, are designed around these lakes, while the historical banksia woodlands and coastal heath are predominantly removed. The sloping topography of secondary dune systems is also substantially erased and replaced with terraced suburban blocks. As a consequence, the ‘designed’ and constructed landscapes that are replacing these (newly) historical, biologically rich landscapes bear no ecological or aesthetic resemblance to their precedents. Within adjacent residential landscapes, anthropologists have also shown how residents create ‘landscapes of attachment’, constructing gardens to create a sense of belonging. Counter to the endemic landscape, this is achieved by preferencing exotic species over native (Trigger and Mulcock 2005). Urbanization, on private and public land, diminishes the footprint of the robust and biologically rich endemic landscape of the SWAFR, in turn, replacing it with constructed landscapes of lessor ecological value. Cultural attitudes remain a critical barrier to ecologically relevant urban design, in both public and private realms. To help overcome this, specific design strategies are required in order for ecological function within landscapes to be saved as well as grown and, importantly, increased within the urban landscape. Inherent in building such a strategy is an understanding of local landscape attributes. Hopper’s (2009) theory articulates strategies and hypotheses for conserving OCBIL landscapes having significant implications towards the design of urban landscapes. For this discussion, key strategies include: the minimization of nutrient inputs, minimizing the importation of alien plants as well as animals and disease, and the planting of locally endemic species. Such practices are also critical in supporting and increasing endemic fauna (Bhullar and Majer 2000) (Davis et al. 2008). The ensuing strategy builds on these foundations. To demonstrate how design strategies can work with ecological principals in creating ecologically regenerative landscapes. In articulating a neo-baroque strategy, it is essential to understand that, in this instance, what is derived from the Baroque is a technique, not a style. Techniques invoking the Baroque can easily be tainted by the term’s historic and stylistic connotations. But if a baroque strategy is understood as a methodology, a simple comparison of baroque qualities with the qualities of a restored ecosystem relays important commonalities (Table 2). The goal in a neo-baroque ecology is to transcend both the prescriptive within the ecological and the superficial veneer of style to reinvest the landscape with that most important of baroque characteristics – meraviglia – a state of wonder. Inspired by discussions of the conceptual baroque (Calabrese 1992) and guided by Wofflin’s considerations of the formal qualities of the seventeenth-century baroque (Lambert 2004), contemporary neo-baroque techniques can be derived for ecological application. This application is manifest in several ways: a preference for movement over places of repose; an affinity for the multiplication of surfaces, contours and folds; and the marvellous use of the chiaroscuro or creating a heightened sense of ephemerality through the mixing of light and shadow. Complexity, allegory, dynamism, multiplicity are all techniques within the toolbox of the baroque, many finding direct correlation with the techniques and aims of ecosystem ecology. In restoring a landscape, ecologists strive to restore or implement key mechanisms of a landscape system (Table 2). According to Hobbs and Norton (1996), the ecologist seeks to increase heterogeneity of species, creating or preserving a complexity of variables made up of different landscape components. Baroque technique can underpin and supplement the performance of basic ecological processes through the manipulation of spatial constructs that positively affect abiotic and biotic conditions. The dynamic complexity of a landscape can serve in preserving water and abetting nutrient transfer by altering temperature, moisture, wind speed and insulation. Ecologists strive to emulate patterns within the horizontal and topographic arrangement of a system’s components. Recognizing this, the constructed landscape mosaic becomes baroque: painterly rather than pictorial, preferencing movement over flaccid minimalism, and wedding the baroque ‘dynamic integration of composition’ (Conan 2005) with what ecologists term ‘dynamic resilience’ (Hobbs and Norton 1996). Baroque technique, constructed with local species, assures that a designed landscape within the SWAFR strives to become a landscape of depth serving a multitude of ecological functions – ecosystem delivery, habitat creation – but also includes the cultural function of aesthetic pleasure. †As adapted from Lambert (Lambert 2004); ‡As adapted from Hobbs and Norton (1996). In creating constructed novel ecosystems within the OCBIL landscapes of Western Australia, the techniques within a baroque toolbox succour the local by embracing and enhancing intrinsic ephemera and site specificities. Already, baroque attributes are inscribed in the Western Australian landscape. The flora, while at times prickly, is also mellifluously rococo in detail and form. From root clusters to regenerating lignotubers after a bush fire, an inherent exuberance is built into this detailed and complex landscape. In Western Australia, the wind is a steadfast daily ritual, with cooling summer sea breezes alternating with drying desert easterlies. The sun blasts its unrelenting rays and in the summer one lives in the perpetual shimmer heat of the west. Currently these local qualities are taken for granted, all but ignored within the creation of civic and private landscapes. Engaging the baroque, landscapes of chiaroscuro can be built that – to use the language of pleasure – dance between sun and shadow, creating landscapes that sway and dance with the delivery of the cooling afternoon breeze and slowing hot desert blasts. Structurally, one can begin to impose shade structures that break the wind, allowing a flat surface to be broken into a chiaroscuro of dark and light. Within open landscapes of reconstruction, these structures serve as seed catchers as well as constructs that bring shadow and pause into the landscape. Leeward to the wind, significant microenvironments for moisture harvesting and preservation become possible and boundaries, in turn, become more permeable, allowing for the flow and mingling of invertebrates and vertebrates (Figure 4). 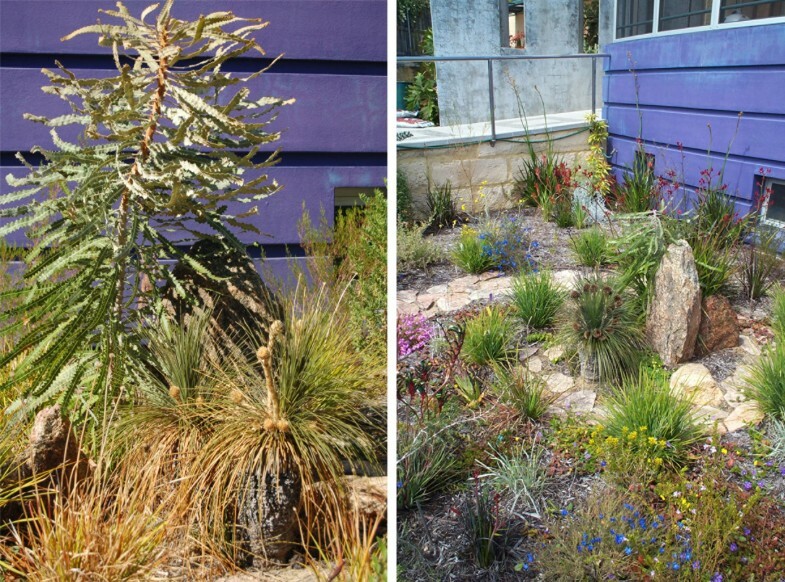 Using the locale’s endemic botanical richness, plant palettes are created that are exuberant of foliage, privileging vegetal excess in the name of increasing species richness (Figure 5). Hand in hand with this, there is the potential to achieve a complexity of habitat, increasing species diversity both botanically and zoologically. 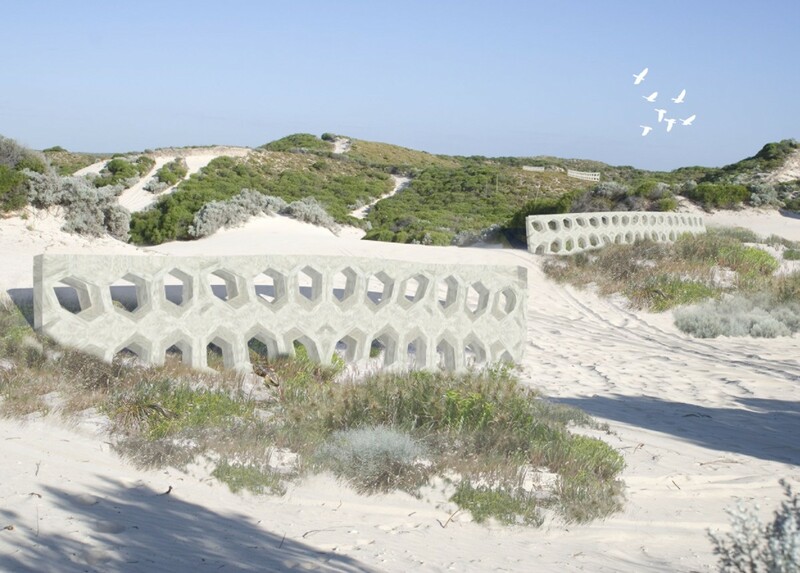 Inspired by the processes that facilitate the growth of coral, this ‘fence’ serves as permeable boundary marker as well as ‘dune catcher’, helping to retain blowing sands in the re-growth of dunes. An example of the exuberance in detail, heterogeneity and form of the OCBIL flora. In both design and ecology, scale matters (Menz et al. 2013). In this regard, baroque strategies function across scales; as a technique, the baroque is flexible and can be applied to the large park, the linear verge or the garden. Within the OCBIL landscape, where every patch is significant, the addition of patches increases the footprint of ecologically relevant landscapes. Embracing a neo-baroque ecology, one can facilitate this increase, in essence crowd-sourcing patches by adding aesthetic function to their value. Additionally by creating gardens of pleasure that are also manifest with ecological depth, horticultural practice can begin to serve the need of systems, addressing some of the constraints, including financial and social, identified by many ecologists (Miller and Hobbs 2007). In recreating the bush, there is an underlying sense that the space does not need to be maintained. If a landscape is treated as a garden, maintenance and care become intrinsic components (Janzen 1998; Goddard et al.2010b). In reconnecting landscape systems with a regenerative design of the Third Nature, a neo-baroque ecology resonates the historic rapport between scientist and garden architect in the temporal Baroque period. In making these propositions, there is a reconnection of the garden of pleasure with environmental good, achieving a ‘scientific sublimation’ (Conan 2005) and, by exploiting the mutability of taste, a neo-baroque ecology allows for ecological restoration in an expanded field. Baroque ecologies: predictable outcomes or ecological conjecture? In Duisburg-Nord, the industrial remnants were heavy and overwhelming, with ecological systems working around and between industrial (human) artefacts. In other landscapes with heavily modified ecologies – mining, salinity, urbanization – design can mark the hand of human intervention, but then return the landscape to an amalgamation of historic ecologies and cultural handprints. This design proposition, one of neo-baroque design strategies, must, like all experiments, be tested. Best practice for ecological restoration changes over time with increased knowledge and runs on the board. Ecologists are aware that spatial construction (the image of the landscape) does not necessarily predict ecological function (Doley and Audet 2013; Majer et al. 2013). A neo-baroque landscape ecology may seem to some scientists to be an extreme move. But with the decreasing footprint of landscapes with extant ecological systems, we collectively, scientist and maker of place, must find every means to regenerate ecological systems within both natural and cultural landscapes. While some may find the idea of a neo-baroque ecology to be one of hubris, close inspection will find a humility and respect for the particularities of Southwestern Australia’s OCBIL landscape and its intricate systems. Design plays a role where ecological thresholds have been created through human intervention, such as salinity, mining or fragmentation. Equally, the baroque concept of meraviglia transcends professional boundaries and is often inherent in ‘natural’ landscapes. With an open and critical discourse as well as a professional cross-pollination of language, technique and strategies (here in landscape architecture and restoration ecology), there is the potential of increasing the footprint of landscapes capable of delivering ecosystem function. aLandscapes containing new assemblies of abiotic or biotic system components and then forming stable alternative ecological states (Hobbs et al. 2006 Hobbs et al. 2009; Hobbs et al. 2013). bIan McHarg’s seminal book, Design with Nature, introduced landscape architects to a systematic method for ‘reading’ and interpreting landscapes. His layering method was an antecedent to Geographic Information Systems (McHarg and Mumford 1969). cIn his global depiction of the biogeography and biodiversity of anthromes (i.e., anthropogenic biomes) and novel ecosystems, Ellis (2013) similarly refers to a continuum from wildlands (or wild habitat), through semi-natural anthromes (or novel habitat), to used anthromes (used rangeland, cropland, villages and dense settlements). Young often disturbed fertile landscape. This title pays homage to Rosalind Krauss’ seminal essay ‘Sculpture in an Expanded Field’ (Krauss 1979). As sculpture moved away from being solely three-dimensional works in a gallery, Krauss expressed the expanded field as lying between – ‘not landscape’ and ‘not architecture’. I would like to acknowledge the open and generous discourse of the editors of this journal, Patrick Audet and Michael Perring. What merits they have found in this cross-disciplinary strategy, they have graciously underpinned with scientific enthusiasm and precision.